cap is up to 15 cm broad, convex shaped with incurved edges when young, carrot-orange with greenish hues. flesh is faintly orange, greenish stains appear with age. 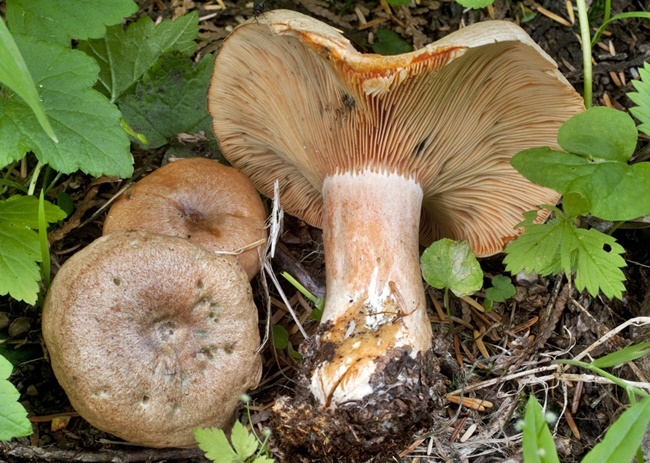 gills are bright orange and descend on the stem, slowly staining green. cutting the gills releases a carrot-colored (NOT white) latex that stains green. stem is light orange, staining green. grows singly or scattered in areas with conifers. mild to slightly acrid taste with an indistinct odor; cook before eating. warning: a number of poisonous or inedible look-alikes have a similar appearance, but differ in that the latex is white rather than orange.